This keyboard package features the PSR-EW300 (K36615). It has everything you need in a starter keyboard, with 76 keys for the more serious piano beginner. With USB to HOST audio and MIDI connectivity, it's easy to expand the capabilities of your instrument by interfacing with creative or educational apps on your iOS device or computer. On-board lesson functions, including the new Touch Tutor, help to supplement regular piano lessons. For fun, plug in your portable music player to the Aux Input and use the melody suppressor to soften the lead vocal so you can sing and play along with your favorite tunes. It is available in two configurations. 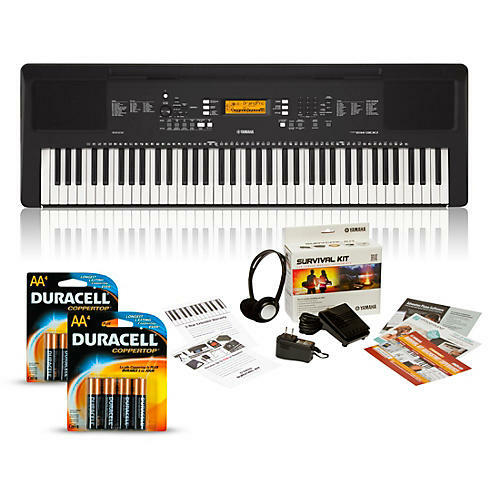 The Essentials Package has two sets of four AA batteries (enough to run the keyboard with two spares), a power supply for when you don’t need to use batteries, a sustain pedal, stereo headphones, a 2-year extended warranty, hundreds of dollars in Rebate Coupons, Link-to-Learn introductory learning guides, songs and more. The Home Package contains all of the above, along with a stand and bench, and a better-quality set of headphones.